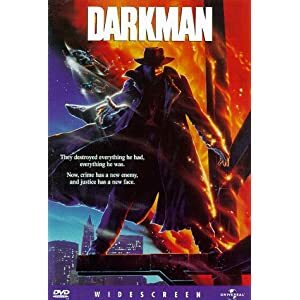 The wild pulp adventure that prefigured Raimi's eventual direction of the Spider-Man franchise...If you've a taste for Hollywood-funded outré, Darkman is one of those rare films that fits the bill. 95 min. Universal. Director: Sam Raimi. Cast: Liam Neeson, Frances McDormand, Colin Friels, Larry Drake, Nelson Mashita. When is a superhero movie not a superhero movie? When it's Darkman, the wild pulp adventure that prefigured Raimi's eventual direction of the Spider-Man franchise. Originally intending to do a film version of The Shadow but denied the rights, Raimi developed the story of medical researcher Dr. Peyton Westlake (Liam Neeson), whose girlfriend Julie (Frances McDormand) unwittingly embroils him in a potential political scandal. Hideously burned and left for dead by gangsters, Peyton uses his incipient liquid skin technology and severed nerve endings as the "super-powers" that allow him to become Darkman, a grotesque avenging angel who feels no physical pain but whose emotions have become dangerous intensified. The delightfully delirious results play like some lost E.C. comic, brought to life with Raimi's trademark cockeyed angles, loony montage and voluminous bag of photographic tricks. Like The Quick and the Dead, Darkman finds Raimi no longer the boy of The Evil Dead, but not quite the man of A Simple Plan and Spider-Man. Emboldened by a studio hungry for the next Batman (after that 1989 film's smash success), Raimi invites to the playground Batman composer Danny Elfman, whose pop-operatic score compliments the film's gleefully over-the-top macho profanity and cartoon violence. Aside from The Shadow, Raimi's neo-Grand Guignol story takes a cue from The Phantom of the Opera, but the tongue never strays far from the cheek: Darkman is a bit like The Crow if it were fun-loving instead of oppressively emo. One thing's for sure: you've never seen Neeson do anything like this. The stage-trained actor gives an emotionally (and, at times, physically) acrobatic performance that's aware of the material's melodrama but commits to it instead of mocking it. McDormand plays his "straight woman," first adding to the sick comedy of it all with her innocent misunderstanding of the depth of her boyfriend's torment and later being drawn into it by Peyton's resistance to confiding in her. Larry Drake, best known as loveable man-child Benny Stulwicz on the hit NBC drama L.A. Law, surprised audiences with his witty turn as sadistic gangster Robert Durant, while Colin Friels is suitably slimy as the real-estate developer with designs on Julie. Darkman may be rough around the edges, but it won my heart in 1990 and only seems more welcome today with its homemade charm that completely escapes modern blockbuster cinema. Raimi flings at the screen uniquely hyperactive visuals, married to crazymaking sound, all part of his masterplan to draw us into a subjective view of Peyton's journey beyond sanity. It's dark stuff, but Raimi succeeds in making us root for Peyton even when we know he's gone beyond the pale and perhaps irrevocably lost his opportunity for redemption. Plus, there are explosions (lots of them), high-flying stunts (including a crackerjack sequence with Darkman hanging from a speeding helicopter), and a carnival sequence that would make Tod Browning smile. If you've a taste for Hollywood-funded outré, Darkman is one of those rare films that fits the bill. 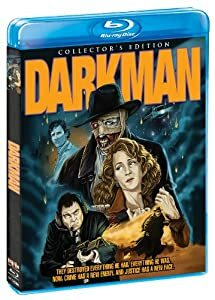 Universal's initial offering of Darkman on Blu-ray—sans extras—didn't exactly have fans crowing from the rooftops, but the new Darkman: Collector's Edition from Shout! Factory adds plenty of value. Shout! serves up the same serviceable A/V as on the previous release. The HD transfer certainly wipes the floor with the previous DVD edition, but it's also one hi-def enthusiasts have flagged as inadequate by current standards. The film's opticals inevitably lead to some visual blemishes (like dirt and some soft shots), but black level is excellent, an important factor for a film that often delves into shadow. Contrast is well calibrated, colors are generally vibrant, and detail can be revelatory, head and shoulders over the DVD. Still, overzealous application of DNR results in some waxy faces and an at-times unfocused look. Raimi's old-fashioned approach to sound design (and the age of the film) spell a relatively underwhelming lossless DTS-HD Master Audio 5.1 mix, but every cartoony sound effect is perfectly clear and Danny Elfman's score sounds robust; just don't expect maximum exploitation of the surround channels—it's a fairly front-heavy mix. Where the Shout! disc starts making friends is in the category of bonus features, which kick off with an audio commentary by director of photography Bill Pope, in conversation with Red Shirt Pictures’ Michael Felsher. Behind-the-camera talent usually show the most enthusiasm for discussing a film, and Pope is no exception in his personal memories of the shoot and his visual approach in concert with Raimi. “Dissecting Darkman – Interview with Liam Neeson” (7:29, HD) is a must-watch, as Neeson discusses what he liked about the material and the process of putting it on the screen with Raimi. He reveals that Gary Oldman and Bill Paxton were also in the running for the part, and discusses how his fear of heights complicated shooting the helicopter sequence. “The Name is Durant with Larry Drake” (15:56, HD) allows Drake to discuss his memorable villain, how he won the role, and how it figured into career typecasting, among other topics. “The Face of Revenge with Makeup Designer Tony Gardner” (13:21, HD) is a cool featurette exploring an essential element of the film (Gardner also discusses the necessity of switching up the design when Liam Neeson stepped in, taking the lead from Bruce Campbell. “Henchman Tales” (12:57, HD) sits down with Dan Bell and Danny Hicks, who played two of Durant's thugs; they're eager to talk, and offer a delightful perspective on the film's making. This should be a thing: henchman tales. “Dark Design” (16:46, HD) checks in with production designer Randy Ser, who discusses what Raimi was after (in the Universal horror tradition) and how Ser went about executing it. “An Interview with Frances McDormand” (10:50, HD) mirrors the new Neeson interview, with the Oscar-winning actress sharing what comes to mind about Darkman, the shoot, and working with old friend/roomie Raimi. McDormand proves, not surprisingly, an incisive interview subject, as she discusses her role in the context of the "damsel in distress" and Raimi's own desire to improve his feminist credentials after the Evil Dead films. “Darkman Featurette” (6:26, SD) is the film's EPK with interview clips and behind-the-scenes glimpses. "Cast & Crew" interviews (8:59, SD) include talking heads Neeson, McDormand, Raimi, and Drake. Vintage Interview Gallery comprises extended interviews with "Colin Friels" (12:14, SD), "Frances McDormand" (20:43, SD), "Liam Neeson" (28:02, SD) and "Sam Raimi" (23:09, SD), who discusses, among other topics, where the story began, why Neeson was right for the role, and what he brought to it. Rounding out the Collector's Edition are the film’s "Theatrical Trailer" (1:47, HD), "TV Spots" (4:24, HD), and four Still Galleries: “Behind the Scenes/Makeup Effects” (4:46, HD), “Posters & Artwork” (2:06, HD), “Production Stills” (8:42, HD) and “Storyboards” (8:22, HD). These bonuses from Shout! are largely new or never-before-made-available to fans. Though there's no Raimi commentary, his twenty-three-minute vintage interview is significant, not to mention the thirty-five minutes of new and vintage Neeson interviews and half-hour of McDormand interviews, plus all the rest of the behind-the-scenes info. All in all, it's a package that should make fans pretty darn happy, at least until a 4K restoration of the film (don't hold your breath). All site content © 2000-2019 Peter Canavese. Page generated at 04/18/2019 12:58:01PM.